I hope you liked Michael Coleman. Here’s another great Michael C: Michael Cooney. Sounding something like the most successful combination you could imagine of Pete Seeger, Mike Seeger, Dave Van Ronk, and Lou Killen, he was one of the greatest folk performers in America in the 60s and 70s, but is sadly forgotten now. He plays a great armful of instruments, each with a degree of mastery that is rarely encountered. He is a good singer, a great storyteller, and a consummate entertainer. He is also one of very few people who has mastered that rarest of forms, the story-song, complete with changes in tempo, dynamics, color, and evocative sound effects. His repertoire spans old-time banjo-ballads, British sea-shanties, folk-blues from the ragtime era, primordial country, vintage jazz, and pretty much that could fall under the heading ‘folk’. On first listen his repertoire and energetic treatment recall a certain unpleasant side of the early years of the folk revival, when bands like the Kingston Trio, Brothers Four, We Five, and Chad Mitchell Trio threatened to turn folk music into acoustic pop music in a sweater with strummed banjos and tight harmonies. But any more than a cursory listen will clearly set Michael apart from the pack. For one thing, he can actually play his instruments to the level that the music demands. He’s been known to spend 12 hours at a time learning to play a bass run like Leadbelly, and his flawless fretless-banjo-frailing didn’t come overnight, let me tell you. Also, he does the real folklorist’s work, delving into the history of the songs, listening to early and obscure recordings of them and learning the full verses that were too strange to be understood by the 50’s mentality and so dropped off of more popular versions. He shows that you can be happy and upbeat without being cheesy, and that you can be slow and mournful without being morose. Basically, if you like folk music of any variety, you will like Michael Cooney. He’s the real thing. I defy you to listen to his 12-string slide-guitar version of John Henry or his epic story-song version of Cumberland Mountain Bear-Chase and not be awed and delighted. Go on, try. Michael Cooney’s father, Bernard (“Barney the Hat”) Cooney, was born and raised in Cicero, Illinois — headquarters of famous prohibition mobster, Al Capone. When he was 14 he would sometimes tell his mother he was going to church, then get his guitar from the woodshed and sing in “speakeasies”. Gangsters would cry and shove money into his guitar. Later he sang table-to-table at restaurants with his brother on violin. By then he knew hundreds of songs and had a reputation for being able to sing any song requested. (His brother later played violin for two years in the Detroit Symphony before they figured out he couldn’t read music.) Maybe that’s where Michael got his ability to sing hundreds of songs of all kinds and play a whole carload of instruments. Michael was born in 1943 in Carmel, California and grew up (mostly) in Tucson, Arizona (where his dad moved to manage the NBC radio station). His parents divorced early and Michael spent much time in foster homes and the orphanage there and in California during his early years. Hardly was he out of high school when he took to the road, hitch-hiking and riding freight trains for two years — to Boston and back, up the west coast, to Colorado (where he spent a few months in Denver and Boulder, recovering from the broken leg he got his first time skiing), ending up in California. In 1963 Michael was quite popular in one club, “The Top of The Tangent” in Palo Alto, where a local high school band that came regularly on amateur nights learned several songs from him. That band went on to perform some of those songs as The Grateful Dead. But the lure of the “Mystic East” was irresistible, and in 1964 Michael went to New York, then Boston. Since then he has lived in various parts of the northeast, plus seven years in Toronto. 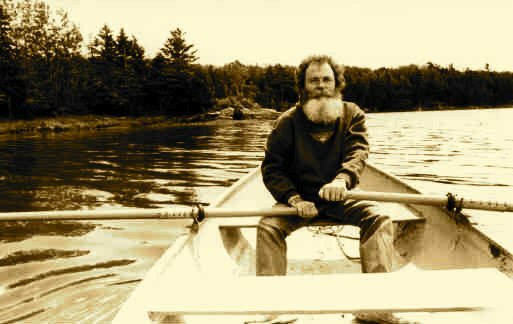 In 1987, realizing a life-long dream, he moved to Maine where he now lives in the small lobster-fishing village of Friendship, on the rocky coast. Michael learned his music from hundreds of people, well-known and unknown. 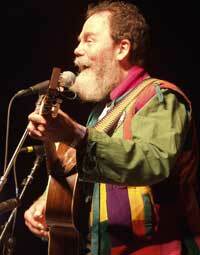 He credits Pete Seeger and Sam Hinton for his interest in traditional folk music and the history behind the songs. Also for his wanting to “help others to feel what I feel when I hear this great old stuff”. He credits Sam, and his old travelling partner, Grady Tuck (now deceased) for his relaxed (“Perry Como school of folk music”) performing style. Michael has been helping others to experience the beauty, power and humor of old and new songs for over 35 years, in countless halls, clubs, coffeehouses, etc., in the US, Canada, Mexico, Great Britain and Europe. He has performed, lectured or done residencies at hundreds of US and Canadian colleges and schools of all levels. He has performed at most of the major North American folk festivals (some many times), including The National Folk Festival, Smithsonian, Newport, Mariposa, Winnipeg, Vancouver, Monterey, Berkeley, San Diego, Hudson River Revival, Old Songs. He has been a performer and mc at the Philadelphia Folk Festival semi-regularly since 1966 and for 15 the last 21 years. Michael was six years on the board of the National Folk Festival in Washington, DC., in 1984, artistic director of Canada’s Mariposa Folk Festival, in 1986, Artistic Director of Philadelphia’s “Maritime America Festival” (part of “We The People 200 – the National Celebration of the 200th Anniversary of the United States Constitution”), and a consultant to many other festivals. He was a member of the Music Panel of the Maine Arts Commission for four years and head of the panel in 1992-93. For twenty years Michael was a director of, contributor to, and columnist for the US’s oldest national folk music magazine, Sing Out! Though he claims to be slowing down, Michael’s tours in 1998 took him to Hawaii and back with many stops along the way, and the year before saw him in Antarctica, on the first passenger ship (a Russian icebreaker) ever to sail completely around the continent. Michael as the ship’s entertainer, visited a dozen research bases and many other sites of historical, zoological and geological interest during the two-month circumnavigation. At home Michael likes to putter in his workshop, mess around with computers, musical instruments, books, and boats. He says he ever seeks “neat songs” plus good and fun stuff (and subscribers) for The Friendship Letter. along comes sally with her nose all tore. note: I was pretty sure these albums were OOP when I ripped, uploaded and wrote about them. It turns out, they’re mostly being reissued. However, seeing as you probably wouldn’t have heard about Michael or known how wonderful he is without the post & music, I left them up. That being said, he has a new album out which you should hastily go and buy at his website. This entry was posted in banjo, Folk, folk blues, fruits, Guitar, old-time. Bookmark the permalink. hello irate, I want to invite you to a new forum called PATRIMONIOS DE LA HUMANIDAD, is a non profit forum wich objective is to rescue the ethnic and folk music. FOREVER A FAN! beverlyabethel@yahoo.com, Pray for they day to see you! And Sesame Street…well best children’s show to ever be featured on! Love “Sesame Street Girls” and “Apple Pickers Reel”. Tom Warmbrand is blessed to know you. 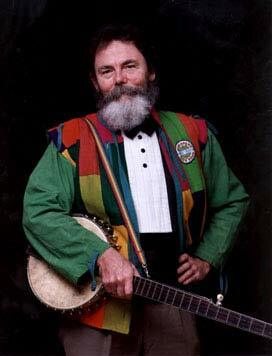 Thanks for such a great page on a great musician, storyteller, folklorist–just as you say. Wish Michael had kept performing (like Pete Seeger did), but it’s good to see he’s living how he wants to. Is there a recording of his rendition of “College Girls” out there anywhere?